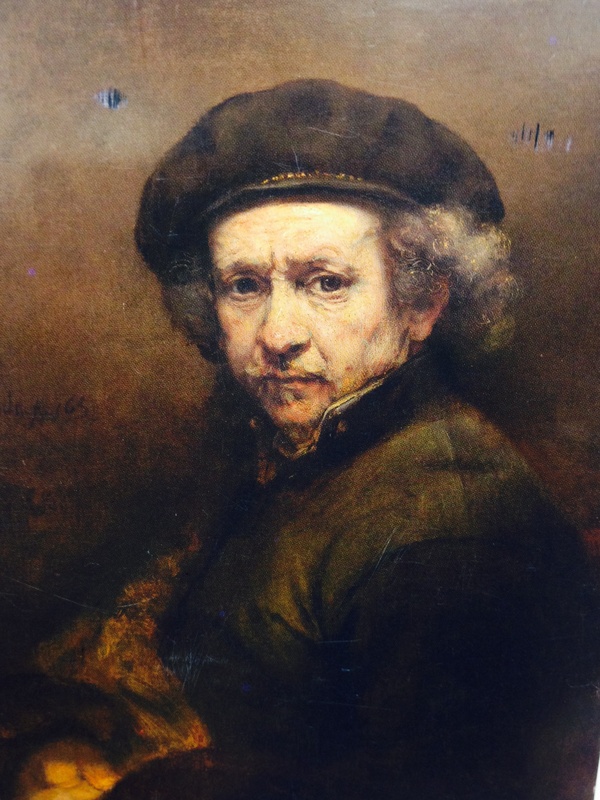 While sorting up the mail last night, I come across a postcard bearing a self-portrait of Rembrandt. This postcard had originated in England and seemed to have been purchased at the National gallery on the occasion of a Rembrandt Exhibition. The self portrait was painted in 1659. I set the postcard to one side, hoping for a moment to study the portrait further. My eyes seemed to be continuously drawn back to Rembrandt’s painting. The first thing that struck me about the portrait was that the painted figure appeared larger than life. At first I thought it the figure was only a model posing for Rembrandt. Upon closer inspection I learned that it was the artist Rembrandt himself. I marvelled at his fuzzy curly hair, bulbous nose, the bags under his eyes. I thought that his eyes conveyed the appropriate weariness that accompanied seventeenth century living. Again, his self portrait did not convey him as pretty, but rather as human and resigned to be so. And so, there is an object lesson here for me. All the haute couture fashion and today’s anti-aging elixirs, expensive make-up and top of the line fancy hair conditioners will be for naught as our descendants look back on our pictures in the centuries to come. Perhaps for me, what will count in the end will have nothing to do with the blonde hair or red lipstick. Rather, what will more accurately convey my time on Earth will be that my face had more “Joie de vivre” laugh lines than frown lines. That would make more sense wouldn’t it?